We are a nonprofit, no-kill animal rescue shelter dedicated to saving the lives of animals in need. ​We rescue abandoned, abused and unwanted animals and give them a second chance at a new and happy life. It is a fact that all of the abused animals who come to our rescue had nowhere else to go. Most have been saved from certain death and many of them have been injured and abused. At Hooves & Paws Animal Rescue, we provide them with nutritious food, soft bedding, excellent veterinary treatment and round the clock loving care. Once rehabilitated, our animals are available for adoption and are placed in carefully screened homes. Animals who are not adopted are guaranteed lifelong care at our animal sanctuary. 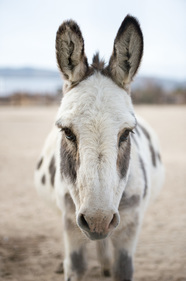 ​Located in Littlerock in the Antelope Valley CA, we currently care for over 150 rescued animals at our sanctuary, including dogs, horses, potbellied pigs, goats, sheep, farm pigs, cattle, chickens, alpacas, donkeys, turkeys and ducks. We are a volunteer based nonprofit organization, not a government funded organization. We could not run any of our no-kill animal shelters without the kindness of our supporters. That’s why involvement thru donations, animal sponsorship, or volunteering is so critical and greatly needed. We also accept donations of goods and equipment that will help with the comfort of our animals. Please visit our wish list page for more information about specific items needed. Our animals need your help, you can make a difference! We desperately need funds to continue saving lives and we can’t do it without your help. We do not receive any funding from the government and rely solely on the generosity of animal lovers like you. Your donations go directly to rescuing animals and caring for our sanctuary residents. We always hope our rescued animals are adopted by loving families but some of our animals have a harder time finding a permanent home. The animals who remain at our sanctuary depend on us to provide them with lifelong care. Guardian Angel Sponsors make lifelong care possible by helping us provide everything our animals need, such as food, bedding and veterinary care. Will you open your heart and home to one of our amazing adoptable animals? We have many loving dogs, horses, goats, sheep, pigs, cows, donkeys, alpacas, rabbits, chickens, alpacas, donkeys,​ turkeys and ducks available for adoption.